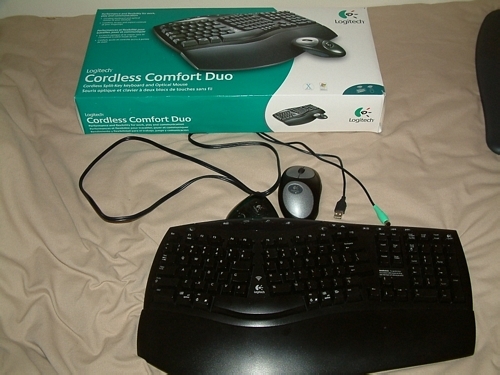 I've used a wireless keyboard and mouse for about three years now, specifically, the Logitech iTouch Freedom. I've enjoyed using it for the past years, but about two months ago, the keyboard started to act up. And when I say act up, I really mean it. Whenever I pressed a key, it would input in the PC about ten random letters and numbers, as well as actions. Nothing would fix the problem, so I was out of a keyboard. 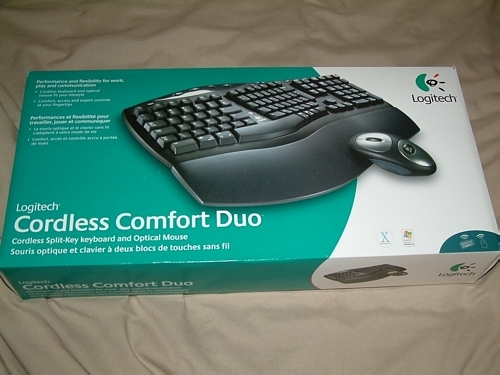 So, I gave Logitech an e-mail and asked to review the Logitech Cordless Comfort Duo. Luckily, they sent me one, and they even let me keep it. But did I enjoy it, and is it worth the money? Read on to find out. I was sent a retail box for review, and the box itself looks like any other keyboard and mouse box. I'm not surprised or anything, but it's always nice to see something unique for a box. I look at the eye candy on boxes for whether or not to buy the product a lot, and this product would not stand out. Anyways, when you first open the box, you'll find the keyboard secured on top, as well as the wrist comfort attachment secured in a cardboard holder. Below that, you'll see the mouse, in a plastic baggie. Next to it is the receiver, which will connect to your PC via USB or PS/2 (with the included adaptor). Besides that are the batteries, four in all (two for each device). I love it when companies package batteries with their products, considering I'm always in such low supply of them. Finally, you'll find the "QuickStart" manual, with the "iTouch" software CD. Everything is packed well, and it doesn't look like anything would be damaged during shipment.